What are the implications of extended Latin characters and combinations for production of digital materials in African languages written with them? 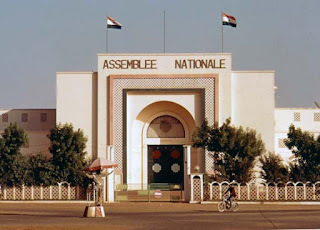 The previous post discussed some of the process of seeking to harmonize transcriptions, in which the Niamey 1978 conference and its African Reference Alphabet (ARA) were prominent. That process had a logic and left a legacy for the representation in writing of many African languages. This post asks if there is a trade-off between the complexity of the Latin-based writing system and how much is produced in it using contemporary digital technologies. Looking at the top row with the smallest editions (less than 500 articles), one is tempted to highlight the high presence of African languages whose orthographies include extended Latin - categories 3 & 4. However, in the group of next highest number of articles (500-1000) there are more editions with category 1 orthographies (the simplest) than there are editions with category 3 in the group above that (1000-2000). And the next highest ranges (covering 2000-10,000) are roughly even between category 1 on the one hand, and 3 & 4 on the other. But then the three largest editions (and 3/4 above 25,000) are category 1 & 2. So with just a visual analysis, there does not seem to be any clear pattern from arraying the editions in this way. Of course there will be other factors than the complexity of the script affecting the success of a Wikipedia edition written in it. But are there ways of looking at this raw data that can give us a clearer idea what might be the effect is of extended Latin - the ARA plus orthographies with other modified letters and diacritic combinations - on the size of Wikipedia editions? One approach is to consider all the above editions combined, per category of orthography (totaling by column). This puts the focus on the degree of complexity of the writing system, perhaps muting the effect of other language- & location-specific factors. On the second to last row are column totals of the number of articles in all editions listed above, divided by the number of editions, to give an average figure.This yields an uneven pattern (2>1>4>3), since in the cases of 2 & 4, one large edition in a small total number of editions skews the category average up. The figures thus obtained show editions written in extended and complex Latin having on average about a third the number or articles as those written in ASCII and Latin-1. Admittedly, this result is in part the result of the way categories have been chosen and figures aligned, but I'm proposing them as a perspective on the use of extended (and complex) Latin, and possible gaps in support. Before considering this in more detail, it is useful to compare with the numbers for non-Latin scripts. What about non-Latin scripts & African language Wikipedias? There are only three editions of Wikipedia in African languages written in non-Latin scripts.8 Two of those - Amharic and Tigrinya - are written with the Ge'ez or Ethiopic script unique to the Horn of Africa. Arabic is the third. How to count this language for the purposes of this informal analysis raises a question. Arabic, of course, is established as a first language in North Africa for centuries, but it is also a world language, spoken natively in the southwest Asia (having originated in Arabia), and learned as a second language in many regions. Drawing users from this wide community, the Arabic Wikipedia is among the top 20 overall, with twice as many articles as all of the editions discussed above combined. It is more than an African language edition. For this analysis, therefore, I have chosen instead to count just the Egyptian Arabic Wikipedia. Again, script complexity is but one factor, and in this case probably not the most important, since the two non-Latin scripts in question have long histories of use in text in parts of Africa - much longer than any form of Latin script. Nevertheless, from the narrow perspective of what is required for users to edit Wikipedia, the technical issues are in some ways comparable if even more demanding. Arabic has had standard keyboards since the days of typewriters. The issues there are not so much the input, but whether systems can handle the directionality and composition requirements of the script. The Ge'ez script on the other hand, does not involve complex composition rules or bidirectionality. However, it has a total of over 300 characters (including numerals and punctuation; more again if extended ranges are added). The good news is that there are numerous input systems to facilitate their input. Literacy in the script and availability of input systems would not be limiting factors for content development in major languages using this script. The difference in development of the Amharic and Tigrinya editions of Wikipedia may relate to both the larger population speaking Amharic (as a first or second language), and its use officially in a relatively large country (Ethiopia). Development of content in Tigrinya - a cross-border language - might also be hindered by issues particular to one of the two countries where it has many speakers (Eritrea). From the above one might suggest that complexity of the written form (to be taken here as including the nature of the script itself, and the size of the character set) may be a limiting factor on content development, but that other factors, such as a literate tradition, official use, and technical support for digital production may overcome such limitations. In the case of African languages written in Latin script, however, any literate tradition is recent, and they are often marginalized in official and educational contexts. For those written with extended Latin, there is the additional factor of lack of an easy and standardized way of inputting special characters. Paradoxically, it seems, a modification of the most widely used alphabet on the planet may actually hobble efforts to edit in these languages. Facilitating input in extended Latin for African language Wikipedias? Wikipedia editing screen with "Special Characters"
drop-down modified to show all available ranges. 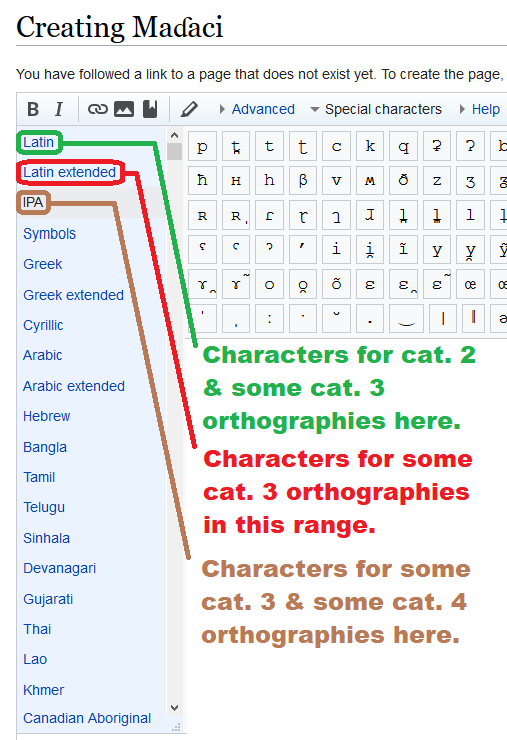 Assuming that the inconvenience of finding ways to input extended Latin characters may be a factor in the success of African language Wikipedias written with categories 3 and 4 orthographies, a quick fix might be to add new ranges for the modified letters used in African languages to the "special characters" picker in the edit screens. As it currently structured, the extended characters necessary for a category 3 or 4 orthography might be sprinkled around in up to 3 different ranges (see at right). And within each range, they are not presented in a clear order, so sometimes hard to find. Since it may be too complicated to have a special range for each language edition, another possibility would be to draw inspiration from the Niamey 1978 meeting's ARA, and combine all extended Latin characters and combinations needed for all current African language Wikipedias into a common new range. Of course as mentioned above, there are other factors that can contribute to the success or not of Wikipedia editions in African languages written with extended Latin, but this innovation would at least make editing more convenient for contributors to these editions. And perhaps it might have a positive effect on the quantity and quality of articles in these Wikipedias. In the third, and concluding article in this series, I'll step back to look at this analysis and consider some other ways to look at the data on African language editions of Wikipedia, and in particular, those written in extended Latin. 1. This categorization was intended to help characterize the technical requirements for display and input of various languages. Although the technology has improved to the point that more complex scripts are generally displayed without the kinds of issues one encountered a even a decade ago, input still requires extra steps or workarounds. The four categories are additive in that each higher category builds on those below, with added potential issues. It is also a "one jot" system in that for example, a single extended Latin character, say š in Northeren Sotho or ŋ in Wolof, makes their orthographies category 3 rather than category 1 or 2 (respectively), and the use of the combining tilde over the extended Latin character for open-o - ɔ̃ - makes Ewe a category 4 rather than 3. In terms of input, the higher the category, the more the potential issues with display and input (although technical advances tend to level the field, esp. as concerns display). 2. The only non-basic Latin character used in Chewa is the w with circumflex: ŵ. Apparently it represents a sound important in only one dialect of the language, and is used infrequently in contemporary publications. On the other hand, there is a proposed (not adopted) orthography for Tumbuka that includes the ŵ. Without this character, either language would be a category 1 orthography; with it, category 3. 3. Bambara is a tonal language. Most often, it seems, tones are not marked in text, however they can be for clarity, and some dictionaries make a point of indicating tone in the entries (not just pronunciation). If tones are unmarked, Bambara would be considered is a category 3 orthography; with tones, category 4. 4. The addition of the letter ŋ puts Luganda in category 3 rather than 1. 5. The dot-under (or small vertical line under) characters used notably in Yoruba and Igbo are particular to southern Nigeria, and not included in the ARA. Yoruba in Benin is written with characters from the ARA.These are tonal languages, and tone is usually marked. 6. When I first proposed the category (itself a modification of an earlier effort), there were some questions why have a category 2 separate from category 1. That distinction had its origins in the early days of computing where systems used 7-bit fonts, meaning that accented letters (diacritic characters) used in, say, French or Portuguese, could not be displayed. Even as systems using 8-bit fonts enabled use of diacritics commonly used in European languages, display issues would still crop up (as a sequence of characters where an accented letter should be). Nowadays, such display issues are rare, and limited (as far as I can tell) to documents in legacy encodings. On the other hand, input of accented characters used may require, depending on the keyboard one is using, switching keyboard drivers or using extra keystrokes - so one will occasionally see ASCIIfication of text in such languages (apparently as a user choice). 7. The difference between categories 3 (extended Latin) and 4 (complex Latin) once were significant enough from point of view of display that informal appeals to Unicode to change its policy of not encoding new "precomposed" characters were common. 8. The Wikipedia incubator projects.includes several African language projects, which are not covered here. These include some in non-Latin scripts (Arabic versions, N'Ko, and Tamazight) and some in Latin-based orthographies. I mentioned one of the latter - Krio - in a previous post, and hope to do an overview of this space in the near future. 9. Average for all African language editions is 7704. By comparison the average for all Wikipedias is 166k. The world 40 years ago, when the Meeting of Experts on Transcription and Harmonization of African Languages took place in Niamey, and that of the Wikimania 2018 conference in Cape Town (which ended last month) seem very distant from each other. But from the angle of the written form of African languages at least, the concerns of the two events are not so distant. One of these concerns is the extended Latin alphabets that were on the agenda in Niamey, and which are used in about half of the African language editions of Wikipedia. This post and the next consider these two vantage points, asking whether extended Latin is associated with less content creation, and what might be done to facilitate its use of the longer Latin alphabet. In 1978, representatives of countries that had gained independence no more than a couple of decades earlier, or in some cases only a few years before, met in Niamey to advance work on writing systems for the first languages of the continent. One of the linguistic legacies of the colonial period was the Latin alphabet (even in lands where other systems had been used). But given the phonological requirements sometimes very different than what Latin letters represented in Europe, linguists added various modified letters, diacritics, and digraphs to write African languages (sometimes even a special system for a single publication1. So, that legacy also often took the form of multiple alphabets and orthographies for a single language, reflecting the different origins of European linguists (frequently Christian missionaries from different denominations), locations in which they worked (perhaps places where speakers of a language had particular dialects or accents), and individual skills and choices. After independence, many African countries undertook to simplify this situation, but they still often ended up with alphabets and spelling conventions different from those in neighboring countries. The linguists and language specialists in Niamey, as in other such conferences of that era (many of which, like the one in Bamako in 1966, were supported by UNESCO), were concerned with further simplifying these discrepancies, with accurate and consistent transcription of languages that were for the most part spoken in two or more countries (whose speaker communities were divided by borders). That included adopting certain modified letters and diacritic combinations for sounds that were meaningfully significant in African languages (some of which correspond with characters in the International Phonetic Alphabet). And that set of concerns - alphabets, orthographies and spelling conventions - turned out to be the starting point for later efforts in the context of information and communication technology (ICT) to localize software and interfaces, including Wikipedia and other Wikimedia interfaces, and to develop African language content online, including for Wikimedia projects. Even if it does not seem as visible as other challenges. What I haven't seen is an evaluation of the efforts at Niamey and the other expert meetings on harmonization of transcriptions, although the most used of the characters in the ARA can be seen in various publications, and all but perhaps one are in the Unicode standard. In any event. the situations of the various African languages are diverse, with some having well established corpora while others are "less-resourced," and in the worst case, inconsistently written. One important element in discussions in the process of which Niamey was part, was the role of modified letters - what are now called extended Latin characters - in transcribing many African languages. The ARA includes no less than 30 of them (22 modified letters and 8 basic Latin with diacritics5). These added characters and combinations are not intended to all be used in any one language, but represent standard options for orthographies. The incorporation of some of these into a writing of a single language makes the writing clearer, and has no drawbacks for teaching, learning, reading, or handwriting (although there are arguments against the use of diacritics). 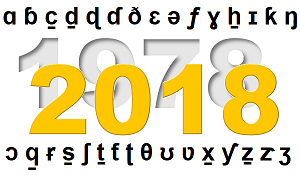 Since the establishment of Unicode for character encoding, the screen display of these characters is not a problem (so long as fonts have been created including glyphs for the characters). However even the presence of even just one or two extended Latin characters leads to problems with standard keyboards and keypads - where are you going to place an additional character, and how is the user to know how to find it? This is a set of issues that was of course recognized back in the era of typewriters. One of the spinoffs from the Niamey conference was the 1982 proposal by Michael Mann and David Dalby (who attended the meeting) for an all lower-case "international niamey keyboard," which put all the modified characters (of an expanded version of the ARA) in the spots normally occupied by upper-case letters. While that proposal never went far (I hope to return to the subject later) - due in large part to its abandonment of capital letters - it was but one extreme approach to a conundrum that is still with us. That is, how to facilitate input of Latin characters and combinations that are not part of the limited character sets that physical keyboards and keyboards are primarily designed for. It's not that there aren't ways of facilitating input - virtual keyboard layouts (keyboard drivers that can be designed like and shared, like Keyman, and onscreen keyboards) have been with us for years, and there are other input systems (voice recognition / speech-to-text being one). The problem is lack of standard arrangements and systems for many languages. Or perhaps in the matter of input systems, the old wag, "the nice thing about standards is there are so many to choose from," applies. The result, arguably, may be a drag on widespread use of extended Latin characters, and as a consequence of popular use on digital devices of languages whose orthographies include them. Or a choice to ASCIIfy text (using only basic Latin), as has been the case with Hausa on international radio websites. Or even confusion based on continued use of outdated 8-bit font + keyboard driver systems, as witnessed in at least one case with Bambara (see discussion and example). What can the level of contributions to African language editions of Wikipedia tell us about the effect of extended Latin? 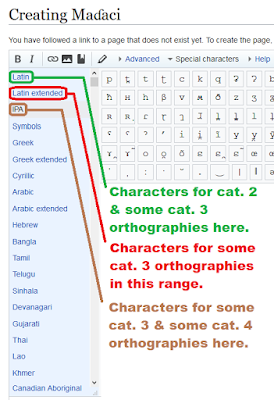 This will be explored in the next post: Extended Latin & African language Wikipedias. 1. For example some works on forest flora which had lists of common names in major languages of the region. 2. Arguably in the case of a language written in two or three different scripts, one could have a system in each script and an accepted way to transliterate between or among them. 3. The only other prominent use I found of the term "reference alphabet" was that of the ITU for their version of ISO 646 (basically the same as ASCII): "International Reference Alphabet." The concept of reference alphabet seems to be a useful one in contexts where many languages are spoken and writing systems for them aren't yet established. 4. This approach - adopting a standard or reference alphabet for numerous languages - was taken by various African countries, for example Cameroon and Nigeria. These efforts were without doubt influenced by the process of which Niamey and the ARA were part. 5. By comparison, the Africa Alphabet had 11 modified letters and did not use diacritics. All 11 of the characters added in the Africa Alphabet were incorporated in the ARA. It is worth noting that in the range of modified letters / special characters created over the years, some are incorporated into many orthographies, others fewer, and some are rarely used if at all. Forty years ago today, the Meeting of Experts on the Transcription and Harmonization of African Languages began in Niamey, Niger. Along with the 1966 meeting in Bamako, it was one of the more significant of a series of meetings* organized in Africa with the assistance of UNESCO to deal with questions relating to standardization of the written forms of African languages. This diversity also meant that the number and range of languages considered in Niamey was greater than in Bamako. On the other hand, like Bamako, the Niamey meeting focused only on the Latin-based transcriptions used in educational contexts (notably literacy) by the recently independent governments in sub-Saharan Africa. This conference was particularly notable for its connection with the African Reference Alphabet, which was intended to provide a common character for each sound encountered in main African languages (rather than each country devising its own symbols or character combinations). African Reference Alphabet. Source: Proceedings of the Meeting, UNESCO, 1981. This effort was significant in influencing orthographies adopted for many languages (although not all). However it did not seem to be explicitly connected with the contemporaneously emerging digital text standards. Although many of the characters in ISO 6438 "African coded character set for bibliographic information interchange" were the same, there were differences that indicate the latter was the result of a separate process (or perhaps "fork" in today's software development terminology). A few years ago I had hoped it would be possible to use the occasion of the 40th anniversary of the Niamey expert meeting to organize a conference to review the status and influence of the African Reference Alphabet and its descendants - with particular attention to technical support in ICT - and issues related to non-Latin scripts used for African languages. And perhaps to broach other topics related to use of African languages in the spirit of the efforts of a half-century ago. Perhaps such a conference will prove useful in the future, but for the moment I'll mark this 40th anniversary with a series of short posts on the 1978 Niamey expert meeting itself and/or contemporary efforts that in one way or another reflect its aspirations. * Several other expert meetings during this period addressed more specific sets of issues. A movie on the life of Bishop Samuel Ajayi Crowther? 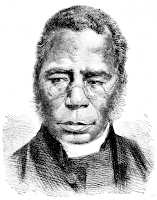 Bishop Samuel Ajayi Crowther (c.1809-1891) was a remarkable figure in West African history, whose life bridged the end of the Atlantic slave trade era and the beginning of the period of European partition of the continent. Could his story be the basis of a major film production? Captured at age 12 or 13 in what is today Oyo State in southwest Nigeria, separated from his family, and sold into slavery, he was "recaptured" by a British anti-slaving force and eventually found his way back to his homeland and became prominent as a linguist and a member of the Anglican clergy (becoming in 1864 its first African bishop) in what was to become Nigeria. Towards the end of his life, however, this success collided with increasingly racist attitudes associated with the imposition of colonial rule. "August 21. The text for this day in the Christian Almanac, is 'Thou art the Helper of the fatherless.' I have never felt the force of this text more than I did this day, as I have to relate that my mother, from whom I was torn away about five-and-twenty years ago, came with my brother in quest of me. When she saw me she trembled. She could not believe her own eyes. We grasped one another, looking at each other with silence and great astonishment, big tears rolling down her emaciated cheeks. A great number of people soon came together. She trembled as she held me by the hand and called me by the familiar names by which I well remember I used to be called by my grandmother, who has since died in slavery. We could not say much, but sat still, and cast now and then an affectionate look at each other--a look which violence and oppression had long checked--an affection which had nearly been extinguished by the long space of twenty-five years. My two sisters who were captured with us, are both with my mother, who takes care of them and her grandchildren in a small town not far from here, called Absika. Thus unsought for--after all search for me had failed--God has brought us together again, and turned our sorrow into joy." Although a figure of the 19th century, Crowther's life story resonates beyond that period so critical in African history. The theme of separation and reunion is universal and powerful. His encounter with some of the worst aspects of racism, which unfortunately is still a very present problem (it was not until 2014 that the Church of England finally apologized for the treatment he received). Crowther's efforts in the area of Christian-Muslim dialogue reflect an important ongoing process. And his work with African languages, particularly but not limited to his native Yoruba, have an ongoing influence. Early in his time in what is now Sierra Leone, where he was settled after reacue by the British, Crowther took an interest in languages and linguistics. Aside from his mother tongue and the English he learned in Freetown, he also learned Temne. In the course of his education leading to clerical vocation, he learned Latin and Greek, which later were essential in translating the Bible into Yoruba. He also learned Igbo (and contributed to work on translating the Bible into that language), Hausa, (in the context of a trip to the north), Nupe (for which he also published a grammar and vocabulary), and Igalla (which is closely related to Yoruba). a dot under seems more often used these days. Apparently much of the early work on writing Yoruba in the Latin alphabet (an older Ajami transcription already exised, likely used mainly by Muslim Yorubas) was begun by missionaries in Freetown working with Yoruba speakers who had been settled there, and Crowther collaborated with them. The system Crowther used to write Yoruba, including marks under e and o to denote open vowel forms of them (the language having a 7-vowel system), presumably built on those early efforts. With some modifications, such as tone markings, that orthography is still in use today, a significant contribution to the written forms of African languages. When back in what was to become Nigeria, Crowther worked on A Vocabulary of the Yoruba Language, (1852), which was apparently the first linguistic work published by an African. His translation of the Anglican Book of Common Prayer and Bible into Yoruba came later. "Crowther has been much vilified by African scholars and historians, who accuse him of having been merely a lackey to the white colonials. His work as a pioneering missionaery who travelled widely and extensively along the River Niger, establishing missions and, above all, putting up a staunch fight against slavery, is hardly even appreciated. Even his works as translator and scholar, who established schools in many parts of the mission, and worked out the first written alphabets and primers for not only Yoruba, but also Igalla and Igbo, is always glossed over." Maybe it's time - already a few years after the Church of England's apology for what was done to him late in his career - to "rehabilitate" Bishop Crowther's image in history more generally, and to provide the current generation with a new perspective on a complex and influential life and life's work? Crowther achieved several firsts, as a clergy in his adopted religion, and as a prominent early linguist specializing in African languages. He engaged with African cultural, linguistic, and religious diversity. He was one of the first students at the famous Fourah Bay College. He personally experienced both slavery and the institutionalized racism of colonialism, but rose above them. He left a legacy that has perhaps been underappreciated. So, could this story, to which the above sketch does not do full justice, be the basis for a major feature film production? One involving Nigerian and international producers and actors? Could it fully, accurately, and appropriately treat the linguistic aspects of the story? The market is there for big Africa-themed productions - including ones in which African languages figure prominently. The action film Black Panther is a recent example. The 1997 historical drama Amistad did well. Language, transcription, and translation may seem like a harder sell, but the recent sci-fi film Arrival had linguistics as a central component of the plot. The biggest challenges are that there is no script or even script treatment on the subject, and that research on the subject might yield more than one reasonable plot line to tell the story, with the potential for conflict between commercial imperatives (especially the bigger the production) and the importance of historical and linguistic accuracy, and sensitivity to the people groups treated. So this post is intended to give a little more lift to an idea that merits consideration and, hopefully, action. 1. Femi Osofisan, Ajayi Crowther: The Triumphs and Travails of a Legend, Bookcraft, Ibadan, 2006. The play was first performed in Lagos in 2002. 2. This was about 10-15 years ago when I was focusing on support for African writing systems on computers and the internet. 3. There are currently reports of conflicts in Nigeria between herders, mainly Fulani (Fulɓe), and farmers of other ethnic groups, which have led to fatalities. Two recent items - a tweet by the Office of the President of Niger touting greater internet access as a key to the digital development component its "Niger 2.0" program (below), and an announcement by IAB-South Africa (logo on right) of a campaign for free internet access in South Africa - raise anew questions about (1) what we mean by "access" in multilingual societies, especially in the service of development, and (2) how to clearly signify those meanings in ways that facilitate clear discussion, planning, and action. In African Languages in a Digital Age (ALDA) I discussed how "access" in information and communication technology (ICT) may refer to many things, but then adopted a binary distinction between on the one hand "physical access," basically the having a functioning digital device with power and connectivity, and on the other hand "soft access," being the software and applications. In a multilingual society, localization (L10n) is, or at least logically should be, a major concern of soft access. Nearly a decade later, the tendency still seems to be to treat access as one thing, focused on the technical or physical aspects of access (devices, connectivity), and leaving out L10n and a deeper consideration of how people in multilingual societies access and might interact with the technology. In the wake of the 2015 "Connectivity Declaration" and Facebook's Internet.org initiative I discussed this problem at some length on this blog: "Access gap in the 'Connectivity Declaration'?" It should be pointed out that these Wikipedia articles do get editorial input from people who have some expertise in the topics covered, so while they may not be definitive, they offer a fair impression of thinking on these subjects. The impression I get from reviewing these articles is that they show exactly the kind of gap between dominant use of "access" on the one hand, and the issues of access related to language on the other, that I had hoped to help bridge with ALDA and other writing. The back story on "soft access"
When I first started looking at the dimensions of access to ICT in early 2000 - which was around the time of the Bamako 2000 "Internet: Bridges to Development" conference - I used the term "meaningful access" as distinguished from "physical access." This was intended in part to address the language dimension that was discussed at Bamako 2000 (its Plan of Action included "plurilingualism" among its 20 "essential activities"), but was largely overlooked in most of the early enthusiasm about how the internet was supposed to transform African development. "software and applications which are designed to enable rural African users to utilize ICTs for their own needs and uses once the physical access has been established." Return to "meaningful access"? Or, "real access"? In the years since, I have occasionally wondered if I should have stayed with "meaningful access," for a harder insistence on the linguistic and cultural dimension of access to technology. And more recently whether in fact that term and soft access might not better be thought of as two distinct but complementary access issues addressed by localization: content and interface. "having a good, affordable connection and then being able to use it in a way that makes sense for you." So, perhaps meaningful access might be a useful umbrella term, covering all aspects of "access" that might be left out if the sole focus is very narrowly on hardware and connections. But that doesn't get us too far in a context where language too easily is left on the margins of the discourse. In this broader use, meaningful access reminds of the "real access" heading used in the early 2000s by Bridges.org (an early ICT4D NGO based in Cape Town, South Africa & Washington, DC, US; logo on left) in recognition that access "goes beyond just physical access and makes it possible for people to use technology effectively to improve their lives". Physical access. Is technology available and physically accessible? Affordability. Is technology access affordable for people to use? Relevant content. Is there locally relevant content, especially in terms of language? Trust. Do people have confidence in and understand the implications of the technology they use, for instance in terms of privacy, security, or cybercrime? Legal and regulatory framework. How do laws and regulations affect technology use and what changes are needed to create an environment that fosters its use? Local economic environment. Is there a local economy that can and will sustain technology use? Macro-economic environment. Is national economic policy conducive to widespread technology use, for example, in terms of transparency, deregulation, investment, and labour issues? Political will. Is there political will in government to do what is needed to enable the integration of technology throughout society? It is very useful when discussing access to technology (internet or ICTs in general) to spread out the subject, as it were, and to see how it might be disaggregated into specific concerns for specific attention, such as what Bridges did. I'm not currently aware of other similar efforts. What about "linguistic access"? Or the "last inch"? So why not just identify "linguistic access" as a key component in a broader "meaningful" or "real" access that goes beyond the usual focus on physical access? That thought occurred, but in the original dichotomy between physical and meaningful access, the latter was intended to go a bit beyond just language, much as L10n also is also concerned with more than just translation. In a redo of Bridge's approach, one might call out linguistic access as a need addressed by localized software / apps and interface. And also localized content, perhaps still under "relevant content," meaning content created in, and/or translated into relevant languages. A completely different way to refer to linguistic access is the "last inch" metaphor introduced by Dwayne Bailey and the African Network for Localisation (ANLoc; logo on right) a decade ago. The idea here is explicitly the language of software and interfaces (and content). However the term always seemed to be used only in the sense of "last inch limitations" and "last inch barriers," thus falling into the same trap of discussing lack of a common language first in negative terms that I've discussed elsewhere. * After all, the whole point of L10n is to bridge that "last inch" and thus facilitate linguistic access. Maybe "last-inch opportunities" or "bridging that last inch" to full access? Wait - access for what? Maybe part of the reason that the concepts and terms seem hard to settle on is that there is a deeper question that needs to be answered first: Access for what? Bridges discussed people using tech effectively "to improve their lives." One.org's "Internet for all" site, home of the Connectivity Declaration), says "Internet Access is Essential for achieving humanity's potential." These are broad well-intentioned goals - everything will be better with access to ICTs, or more specifically the internet. But what exactly is the vision of what people will do with access that will yield such vaguely wonderful outcomes? Most examples of use of the internet on site Internet for All (which by the way makes no mention of L10n for access or of languages at all outside of a few translated versions of the Connectivity Declaration) relate to consumption of information and e-commerce. No problem as far as those go - they are important. But is access for all really about increasing markets? In other words, in what vision of access to technology would linguistic diversity not be important? Is it one where people participating in a market for info and goods are really only those speaking a small range of dominant or "elite" languages? Is our current discussion of "access to the internet" really prioritizing certain uses and certain linguistic and cultural priorities? I pose such questions as a proponent of greater access to ICTs (powered in part by better provisions for use in more languages). 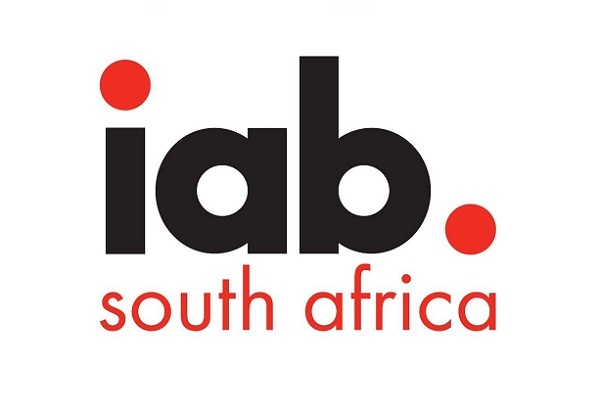 One of the dimensions I see as fundamental is the creation of content which while globally accessible, might be local or regional in relevance. Such non-mainstream perspectives may be as important for global learning as they would be for cultural/linguistic survival and development. Even if the terminology about types of access might be hard to pin down, and even contested, it is essential to begin with acknowledgement that "access" to the internet and ICTs in general is not one thing and needs to be considered from several angles including languages, whether in Niger, in South Africa, or anywhere else. * For example the discussions at the end of "Breaking the 'dialect barrier'" or on my other blog, "Reimagining 'language barrier'."